The elite of German Porsche tuners sounds like that: Ruf [Roof], Gemballa [Game Bulla] , Tech Art [Tech Art], Hamann [Humun]. But there also are young aspirants coming up. Like that:9ff! Nine What? [Noin FF]! Sounds good? Yes! And, looks great too. In terms of appearance, the Nine Eleven of the new Porsche tuner from Dortmund appears distinguishing, mainly because of its wheels in ray-style. The company founded by a former BRABUS and Ruf engineer presents a sensational Nine Eleven, up to 700hp can be ordered. Either the Turbo or the GT3 version of the classic from Stuttgart-Zuffenhausen can be basis for this conversion. 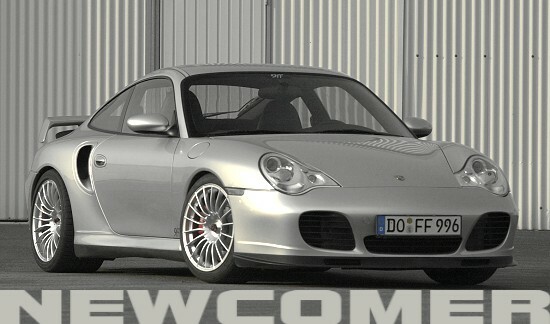 And even though it had not been coming out as the fastest one amongst three other tuned 996 competitors at a comparative test of the tuning magazine AutoBild Test&Tuning, it excelled as the most accomplished contender. Apart from the motor tuning sets, the Porsche refiner is able to supply almost everything that improves driving performance and look of the 996. Also on these fields, customers can select from a wide variety of packages. See next site...!